New smartphones include inductive or wireless charging capabilities as one of their key features. Recent handsets such as the Samsung Galaxy S10, the LG G8 ThinQ, and the Nokia 9 PureView can all be charged without a wire. But what if you own a smartphone that doesn't have this feature? Learn about the best ways to use wireless charging pads, as well as ways to make some phones capable of wireless charging ​even if they don't have the built-in technology. Many of the wireless compatible handsets on the market have official charging pads available for them. One of these pads might be included for free when you buy the phone. If not, search for the official product on the manufacturer website or on a big carrier website like Verizon or Sprint. The official product for your handset is often the best bet, but there are numerous third-party wireless charging pads available if you want a cheaper option. Some pads charge two devices at the same time. 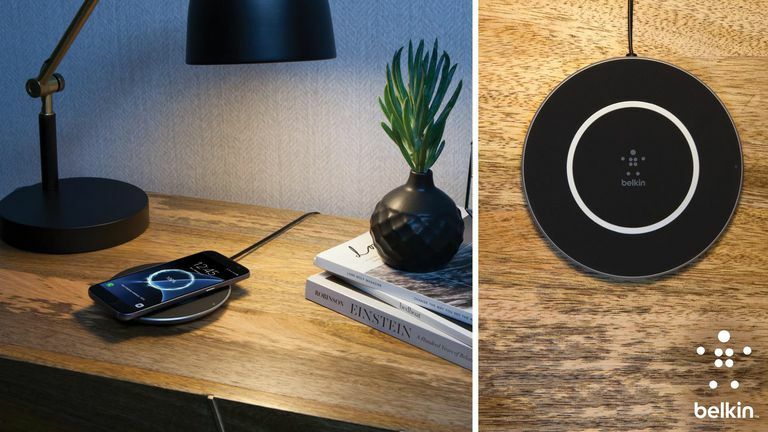 Energizer, among others, produces a dual-device charging pad. Whichever option you decide to go with, the way you use them with compatible handsets remains the same. Wireless charging pads use electromagnetic induction to create a field that a special receiver coil in the phone uses to feed electricity to the smartphone battery. Phones that are capable of wireless charging come equipped with an induction coil. The charging pad is comprised of two components: the pad and a separate power adaptor. Plug the adaptor into the socket on the charging pad, place the pad on a flat and stable surface, and connect the adaptor into the power supply. Depending on the charging pad, there may or may not be a power light. Many wireless charging pads have a light which only turns on when a phone is charging. Other charging pads have a light to indicate power and another to indicate that the phone is charging. Place your wireless capable phone on the pad, with the screen facing up and placed centrally over the pad. When the phone is placed correctly, the light on the pad turns on or flashes to show that the phone is charging. Most handsets also display a notification on the screen to tell you that it's charging wirelessly. In most cases, charging on a wireless charging pad is slower than if charging using a normal cable plugged into your phone. It's also normal for the pad and the phone to become slightly warm to the touch when charging. It's okay to place the phone on the charger all day. The built-in circuitry in the phone and the charger pad stops the charging process once the battery is at 100%. There is no danger of the battery overcharging or overheating. If your phone doesn't have wireless charging technology built in, adapt it to work on a charging pad using a wireless charging adapter case. Several phones, including the iPhone 7 and 8, and many Android models like Samsung and Pixel, can be fitted with a case which contains a wireless charging chip. These cases are slightly bulkier than normal phone cases as they include the chip and a connection to the micro USB port (or another connection type) on the phone. Samsung introduced built-in wireless charging capabilities with the Galaxy S9. If you own an older Samsung Galaxy phone, purchase a replacement back cover with a built-in wireless charging chip. This is slightly bulkier than the standard back cover, but not by much. You can also buy a wireless charging card that contains the appropriate chip, which is slotted over the Galaxy battery. Metal contacts protruding from the card connect with a terminal next to the battery. Using this method means that you don't have to use a bulkier back cover. If you aren't ready to upgrade your smartphone, purchasing a wireless charging case or card is an excellent way to inexpensively use wireless charging.